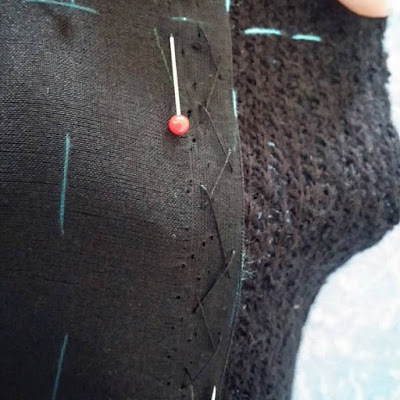 EN: As I had mentioned on a previous article, Claire Shaeffer’s book “Couture Sewing: The Couture Cardigan Jacket” describes how to reinforce the center front panel preparing it for the buttonholes/buttons. In this book the center front panel is reinforced with silk organza and there is a stay along the front edge, made of a strip of silk organza selvage. The buttonhole placement lines are reinforced with strips of fusible interfacing and the silk organza is quilted to the fashion fabric, as opposed to quilting it with the lining fabric. This provides the center front with the needed stabilization and also makes room for the buttonholes, but I rather like the looks of the quilted lining also on the center front panel so I came up with a slightly different method of my own. Besides the silk organza reinforcements advised by Susan Khalje on her video class, I added a rectangle of silk organza to the entire center front panel (after it has been thread-traced) and cut the rectangle so one of its longer edges has a selvage. I placed the rectangle on the wrong side of the center front panels, aligning the selvage with the front edge (I measured the front length exactly and marked it on the selvage edge); catch-stitched the selvage as shown below and basted the remaining outlines using different color bastings so I don’t confuse these bastings with the already thread-traced stitching line. PT: Como já mencionei anteriormente, o livro “Couture Sewing: The Couture Cardigan Jacket” descreve como reforçar a o painel central da frente de uma jaqueta com botões e casas de botão. No livro a frente é reforçada com um retângulo de organza de seda e é acrescentada uma fita feita com a aurela da organza de seda ao longo da beira da frente, para que mantenha o seu tamanho sem esticar. O sítio das casas de botão é reforçado com tiras de entretela termo-colante e neste painel é a organza que é “acolchoada” no boucle, em vez do forro. Este processo estabiliza a frente e dá o espaço requerido para trabalhar as casas de botão antes de colocar o forro. No entanto gosto mais do avesso com o forro acolchoado em todos os painéis, incluindo os centrais da frente, algo que a Susan demonstra nas suas aulas vídeo para uma jaqueta com colchetes ao longo da frente,… Então pensei numa forma de conseguir exatamente esse efeito. Além de reforçar algumas áreas-chave com organza de seda como descrito nos vídeos da Susan Khalje, acrescentei um retângulo de organza de seda aos painéis centrais da frente (previamente já marcados com alinhavos), mas cortei o retângulo de forma à aurela ficar num dos lados compridos do retângulo. Medi o tamanho exato do molde da frente e marquei essa medida na aurela da organza. Cosi com pontos em cruz escapulário a aurela à beira da frente e alinhavei as restantes beiras da organza ao tecido, com alinhavos de outra cor (para distingui-los das marcações anteriores). 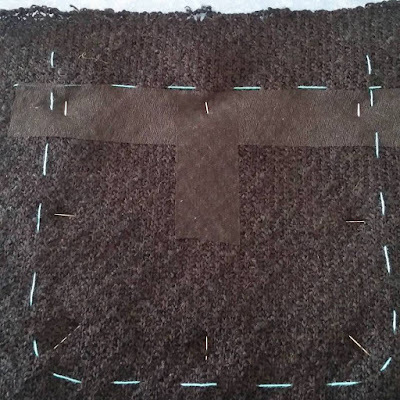 EN: Before sewing the buttonholes on the right front, always run a test buttonhole to test its size; I’m using polyester buttonhole twist after it has been threaded through beeswax and pressed with a hot iron. 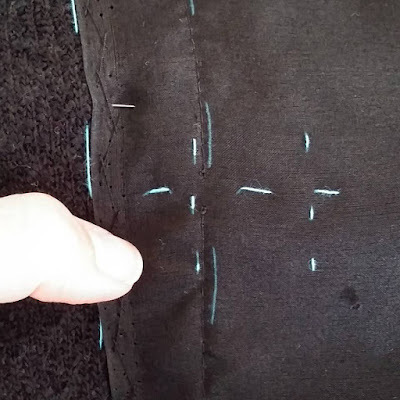 Claire Shaeffer’s tutorial in the DVD that comes with her book is exceptional, if you need help sewing this kind of buttonholes. PT: Antes de começar a bordar as casas “a sério” na frente direita, é boa prática fazer uma amostra para testar o tamanho ideal da casa. Estou a usar linha torçal de poliéster que é passada por cera de abelha e passada a ferro (para a cera derreter e penetrar bem na linha). O passo-a-passo contido no DVD que vem no livro da Claire Shaeffer é excecional para aprenderem a fazer este tipo de casas de botão. EN: Here’s my finished sample; I think it turned out quite good and 2.7cm seems ideal for the crystal/metal buttons. PT: Aqui está a minha amostra terminada; acho que ficou bastante bem e 2.7cm é o tamanho ideal para os botões de cristal e metal. 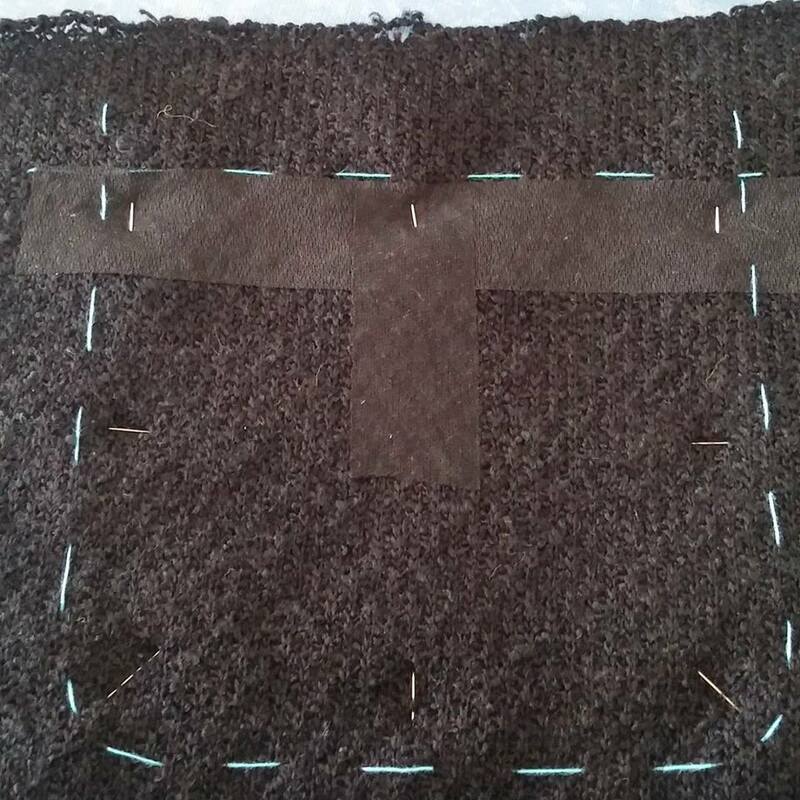 EN: Now I’m off to cut the lining, sew the buttonholes on the right center front and make a quilting and seam sample! More later! PT: Agora vou cortar o forro, bordar as casas na frente direita e fazer uma amostra de uma costura com o acolchoado de forro! Até breve! 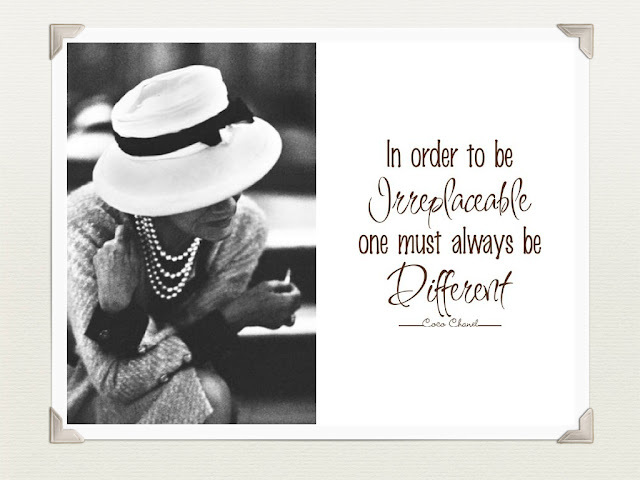 Tany, you a progressing quite well! Your jacket is looking quite wonderful. I feel very fortunate that you are providing such helpful information for the construction of my own jacket. Thank you! I'm still struggling with a proper fitting muslin. I used the measurements on the pattern envelope as a starting point and ended up with a muslin that was several sizes too small. I have no idea why I didn't flat pattern measure.